Let me try to give you a sense of a frustrating feeling that pervaded this trip. Phill would show me an interesting plant, and then while I would work to photograph it he would wander off to show Beth things of interest. Fragments of their speech would waft my way, and as I'm trying to complete my rather consuming technical work, I would hear Phill casually call my way exasperating things like, "Something for you over here, Barry" or "I don't think you've seen this species yet, have you Barry?" Pleasant, yes, but exasperating nonetheless. 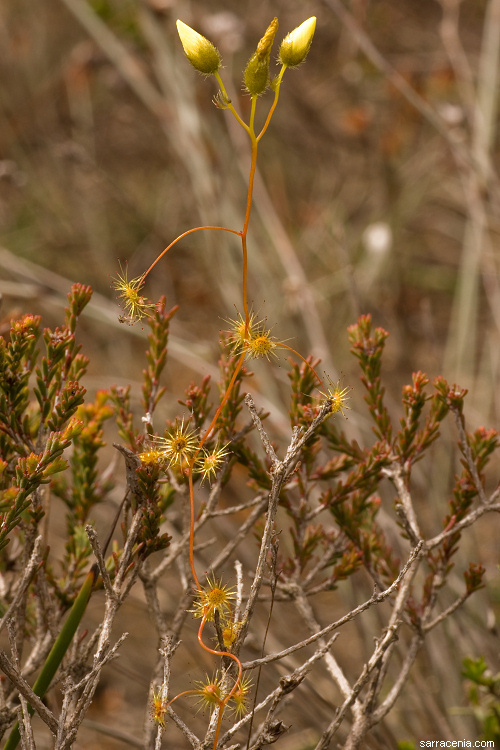 That was how Phill introduced me to this yellow-flowering climbing species, Drosera intricata.